"Sweet potatoes with orange and bourbon. I use 1/2 cup sugar but if you prefer candied sweet potatoes, use the whole cup. Orange juice can be substituted for the bourbon if you are serving to small children. Originally submitted to ThanksgivingRecipe.com." Boil sweet potatoes until tender. Peel and mash until more or less lumpless. Add brown sugar, orange juice and zest, bourbon, butter or margarine, and pumpkin pie spice. Mix well. Spread in shallow dish (10 inch deep dish pie plate works well). Bake 30 minutes in a 350 degree F (175 degrees C) oven. Top with marshmallows and broil very briefly. This was ok, I have a better one that I use all the time and want to keep the best so will discard this one. This is so good. Not too sweet. I chose to leave the marshmellows out. I have made it several times now and everyone loves it. Yummy! Didn't have the bourbon or the pumpkin pie spice, so added allspice, cinnamon and nutmeg. Browned the marshmallows as recommended. It came out great. Loved it and so did my family. 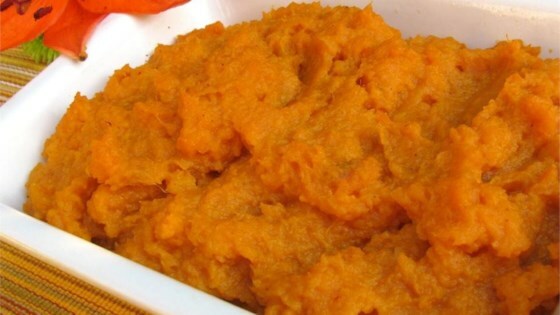 It's now my favorite recipe for sweet potatoes! Easy, and delicious. I didn't have an orange, so I substituted with std orange juice, and it turned well. This will be a fall staple at our dinner table.